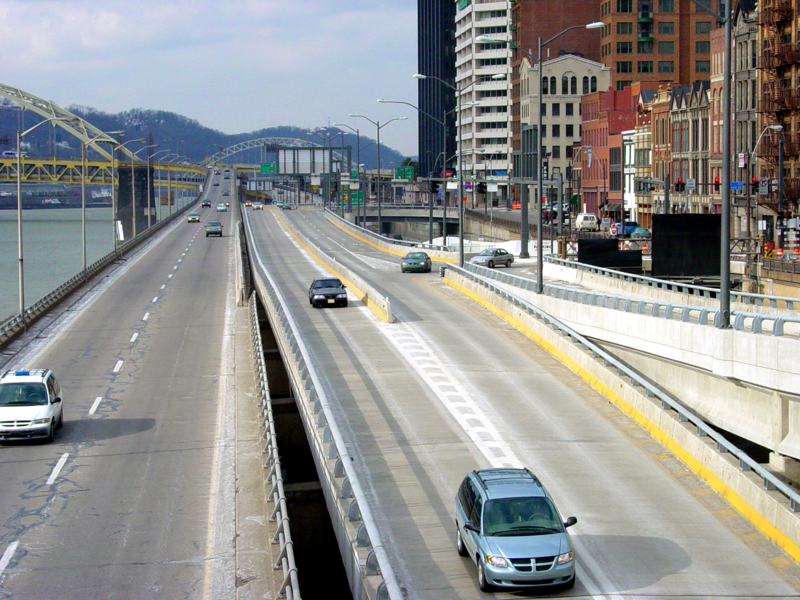 SAI was responsible for the preliminary and final highway as well as structure design of the reconstruction/rehabilitation of Ft. Pitt Boulevard Eastbound including seven bridges, one retaining wall and one tunnel, along with associated improvements to the adjacent approach and intersecting roadways. Seven bridges (including the 1900′ 35-span main viaduct). 2400′ concrete retaining wall supporting Ft. Pitt Boulevard Westbound. Use of Vierendeel trusses for the sign structures (This scenario was proposed by the Department of City Planning, in conjunction with their efforts to upgrade the Mon Wharf corridor). Painting of sign structures, light poles, bridge girders, and steel handrails with the City’s standard Central Business District (CBD) Gray color. Use of open-type bridge parapets in response to a request from the community. Reconstruction of 500′ of the flood protection system on Ramp D.
Upgrades to the existing 150′ tunnel beneath Ramp C.
“T” piers that support the 35-span viaduct designed to incorporate existing bridge columns and foundations without reinforcing the existing foundations.